Batata Vada| Batter fried potato dumplings. Boil the potatoes until soft, peel and mash it. Heat oil and add mustard seeds.Allow them to crackle. Add the curry leaves, followed by ginger, garlic, green chilli, turmeric and salt. Add asafoetida. Mix well and cook for a few minutes till the ginger and garlic are just fried. Add the mashed potatoes to the tempering,and add chopped cilantro,saute nicely. Add little salt and mix it well. 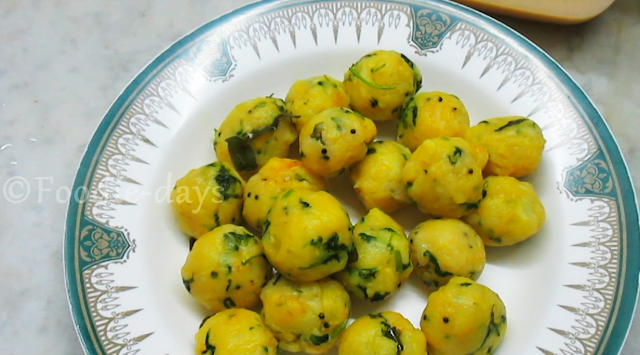 Divide the potato mixture into equal sized portions, approximately the size of a lemon and form them into balls. Make a thick batter with the gram flour and the other ingredients mentioned for the batter. Be sure to add the water little at a time and check the consistency, so the batter does not become too thin. In a deep pan or fryer, heat the oil for deep frying. When the oil is hot, dip each ball in the batter and deep fry until golden brown in color.